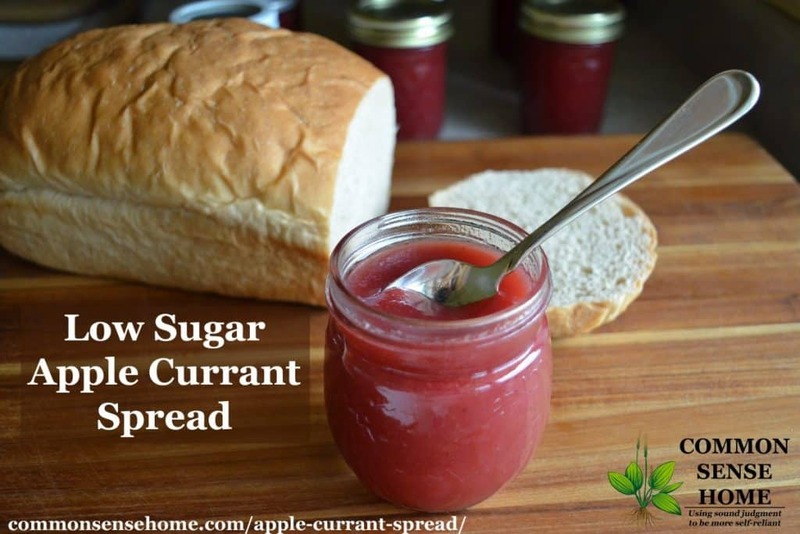 I came up with this low sugar apple currant spread to use up this year's bumper crop of currants. Since currants are quite tart, currant jelly uses a lot of sugar. Currant seeds are sizable, so I knew a regular jam wouldn't be popular with my family. (Plus, currant jam is still loaded with sugar.) Instead, I cooked up my currants and ran them through the chinois (food mill). This gave a mix of juice and a little bit of puree. I cooked the currant juice/puree up with some applesauce (and cinnamon), but it was still very runny and tart. (Both currants and apples have natural pectin, but not quite enough in this case.) I added sugar for sweetening, and some Pomona's low sugar pectin for thickening. Voila! With a full half teaspoon of cinnamon, it tastes almost like a cinnamon red hot, so use less if you want more fruit flavor. Don't forget to thoroughly mix your sugar and pectin, or the pectin is likely to clump. Clean currants, removing leaves and debris. 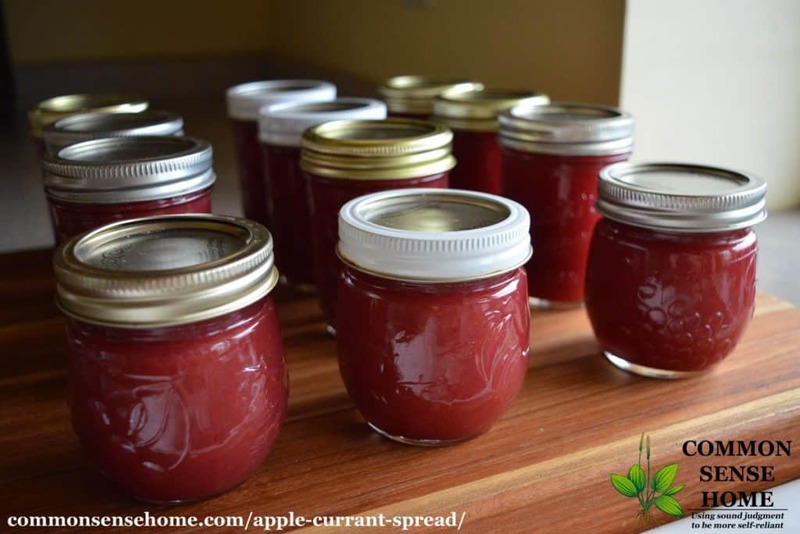 Do not discard stems, which contain high amount of pectin. Rinse well. Place in a heavy bottom pot on low heat and cook until soft. Mash down with spoon or potato masher. Place in heavy cheese cloth or flour sack towel to drain (squeeze to get maximum amount of juice), or run through a food strainer. Measure out 1 1/2 cups. If short on currants, you can substitute a little more applesauce. Sterilize jars and prepare water bath canner. Prepare two piece lids. 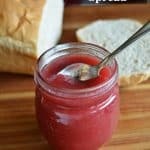 Place currant juice and applesauce in a medium heavy bottomed sauce pot. Add cinnamon and calcium water. In a small bowl, mix together pectin and sugar. Bring fruit mixture to rolling boil. Add sugar/pectin mixture all at once, stirring until pectin is completely dissolved. Return to boil, boil one minute, remove from heat. Pour spread into jars, leaving 1/4″ head space. Wipe rims and seat two piece lids. Process in hot water bath for 10 minutes in a boiling water bath canner. When time is finished, let rest for 2 minutes, then remove from canner. Allow to cool. Remove rings and check seals. Label and store in a cool, dry location out of direct light. Calcium water is included in each box of Pomona’s pectin. 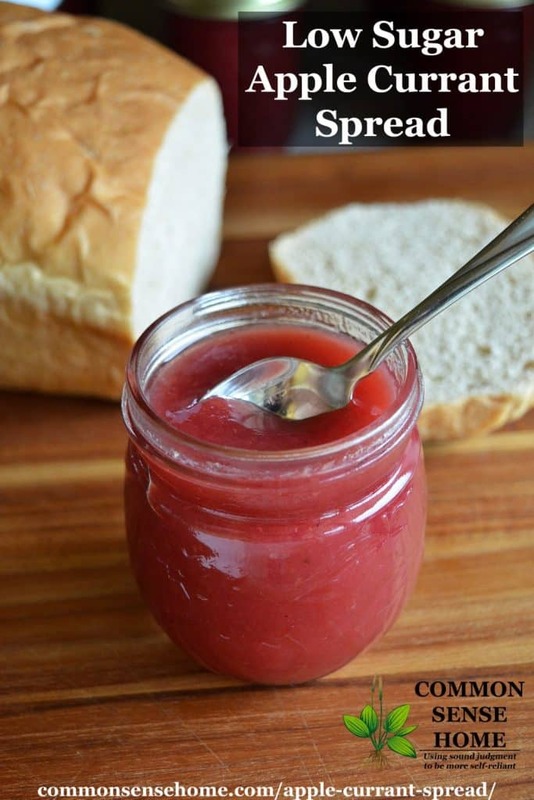 It reacts with the Pomona’s pectin to set the jam/jelly. When you open a box of Pomona’s, it contains two packets – one of calcium powder, and one of pectin. Each box contains enough product to make several batches of jam or jelly. The calcium powder is mixed with a half cup of clean water. I keep mine in an eight ounce mason jar and store it in the refrigerator between uses. When I’m ready to make jam, I give the water a stir (the powder settles), measure the amount needed, and return the rest to the fridge. Another low sugar pectin would also be likely to work, but I’m not sure on amounts for other brands.